The Pro-Bag is a durable padded nylon case that allows you to easily transport your Beatnik and supplies when you're on the go! The size of a standard briefcase, you can comfortably carry it by the nylon handles or the adjustable shoulder strap. It includes elastic rings for your drumsticks, batteries and pens, strong mesh pouches for your adapter, spare batteries and Beatnik Rhythmic Analyzer, and plenty of room for your method books. The AC1 Adapter is designed to supply AC power to the Beatnik Rhythmic Analyzers models RA1200p and RA800p. Note: This adapter is for use in the USA and Canada (110V) and is not suitable for use in Europe or Asia. 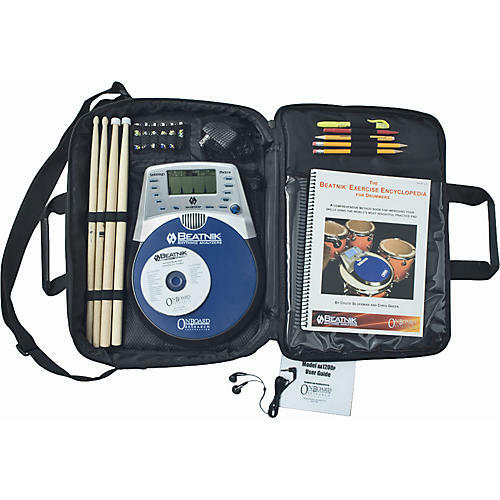 The Beatnik Exercise Encyclopedia for Drummers is a comprehensive book detailing the numerous options for practicing with the Beatnik Rhythmic Analyzer. The drum book is written in an easily understood and well-organized manner by Chuck Silverman and Chris Green. Together with the Beatnik, this book will develop your rhythmic accuracy so you learn to play drums to the point of perfection.